Create and support a business environment where people can make mistakes, learn from them and apply those lessons to future work. 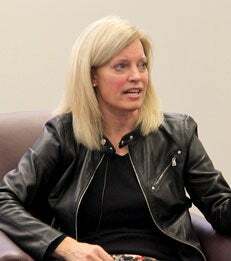 Susan Jurevics (MBA ’96), chief executive officer of Pottermore, joined Dean Peter Henry and MBA students for NYU Stern’s Block Lunch event series this spring. Jurevics, an alumna from Stern’s Langone MBA Program for Working Professionals, described her career including stints at Nickelodeon, Barbie/Mattel and, most recently, as senior vice president of global retail CRM and brand marketing at Sony. Over the course of the semester, students had an opportunity to hear candid perspectives from thought leaders in varied industries. Past speakers for Spring 2014 included Christopher Howard, president of Hampden-Sydney College, and Tom Bernstein, president and co-founder of Chelsea Piers.